What do You know about Cracow ? Karol Wojtyła moved here on 10th August 1944 as a student of the clandestine Krakow Archdiocese Seminary. He was granted the Sacrament of Orders on 1st November 1946 by Cardinal Adam Sapieha in his private chapel. It was in this Metropolitan Curia that Karol Wojtyła acted as bishop from 1958, and later as the Metropolitan of Krakow - until 16th October 1978 when elected to the Holy See. 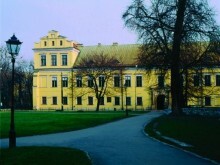 Pope John Paul II stayed in this Palace during each of his pilgrimages to Krakow. Above the entrance is the famous window from where the Pope would welcome the youth of Krakow as they arrived to meet him. In the Palace yard, there is a statue of John Paul II, a gift offered and created by Jole Sensi Croci, presented in May 1980. At the time of the death of John Paul II, and for many weeks later, the square in front of the Palace was filled with people praying for the peace of his soul. Next to the Metropolitan Curia at 1 Franciszkańska Street, there is the building of the Pontifical Academy of Theology, founded in 1981 by John Paul II, which replaced the Faculty of Theology at the Jagiellonian University.